This is where it all began: A paramilitary force infiltrates a multi billion dollar aerospace compound taking hostages, but issuing no demands. With U.S. Special Forces in over their heads, the Commander in Chief turns to his final option: you. As a member of a secondary F.E.A.R. team, you are brought in to discover more information regarding the secret project at the Armacham facilities. Expect the intensity of battle to continue in the second expansion pack to the critically acclaimed first-person shooter, F.E.A.R. F.E.A.R.Extraction Point Expansion Pack takes you to the next chapter ? now Alma is looking for retribution! Normally I don't write reviews on such things as computer games. Mostly, kids buy the games and are going to get it no matter what I say. This game is the exception. The graphics are a little dated, but the story line, and smooth motion of the enemy characters helps make up for it. It is woefully over priced for a single program--but you get three--that helps a bunch. Overall, the first person shooter type programs could all have been lumped into one story line and call it 'Snipper time', as far as I'm concern. In F.E.A.R., this is not the case at all. Let's just say when you first get the game running...'strange' things begin to happen. It is these strange things keeping the game from getting old. Get ready for a lot of different shades of gray for color and contour. You pump shotgun is still my primary weapon. When the lights flicker...get ready for it. Unlike a lot of modern programs--where the 'alpha' programer keeps building games where you have to get on the yellow brick road and follow it...if you don't, you never complete the game. In F.E.A.R, this is not the case. Apparently there are multible routes you can take--this way, when you complete the game, you can restart it and go a different path each time. In other words, the replayabilitly of this game is pretty fine--that's important. Everytime I play the game (then look at the fifty dollar price tage) I don't feel as stupid for throwing my money away. Those other games, not letting you adventure around, are over priced greatly because of it. Maybe one day they'll learn their lesson. I called it that because the third one, an expansion pack - perseus mandate never ran no matter what I tried, so I have no idea what it is like. The first two are all right - the movement when you kill the head bob, is good. the weapons in it are good but the big launcher is too slow to reload. my fav was the auto turrets, what a great idea, you just toss in a few to a busy zone and wait, then clean up the rest of the bad guys. the endless "visions" and phony pysch over-voicing did get monotonous. I found the first ending ok but the fear extraction point ending was crap. The game kills off all your pals, jin (your girlfriend) and finally you too. thumbs down on that score. hopefully the new one due will be better. I'm going to let lots of others play and review it first before I buy. Overall the game is a great fps - bit cheap on surroundings, nothing complex like doom, quake etc but the shootouts are what it is all about. F.E.A.R. and its two sequels are fantastic games, even if they've gotten a bit dated as far as graphics are concerned. I've never been an eye-candy junkie and still enjoy playing older games as much as newer ones (and sometimes more!). This is a fantastic trilogy, maybe one of the best of the last decade. It's also a great way to spend your time as you await the release of F.E.A.R. II by brushing up just how frightening Alma can be... Playing the original game at night and alone can be very interesting. The first F.E.A.R. game is easily the best of the three. The best 'horror' FPS I've ever played, it puts you in the shoes of the capable F.E.A.R. Point Man, complete with a wide variety of weapons that all just 'feel' right. Each weapon at your disposal is unique and has advantages/disadvantages that makes selecting the right weapon for the right situation critical to success, especially at the harder levels. The 2nd installment, Extraction Point, is the weakest of the three. Taking up the plot line exactly where it left off (with disappointing results, given the cliff-hanger ending of F.E.A.R.) it is filled with levels that are all very similar in layout. Much of the game is spent wandering subway tunnels, and without the same sort of intense unease caused by not knowing who/what Alma is nor what she is capable of, it misses a beat on the intensity scale. The 3rd installment, Perseus Mandate, is better than Extraction Point, with a much more intense combat element. 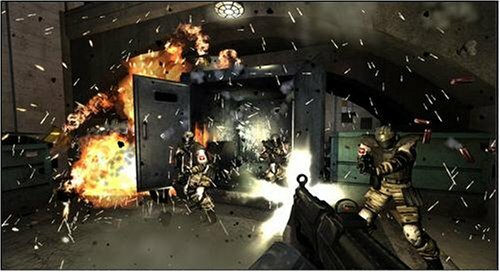 Bigger guns, bigger enemies, and more carnage in general make this the most action intense of the three games. I enjoyed the new enemies and weapons, as well as uncovering more of the story. However, don't expect any huge surprises from Perseus Mandate; if you've been paying attention you'll see many of the 'reveals' from a long way off. There are a few issues with these games, including the failure to include native wide screen support in Extraction Point. There is a work around to this that involves modifying a game file (google it), but it seems silly that they never patched the game to support it, especially considering that the original F.E.A.R. game did! Re-releasing games as good as this trilogy without a support for monitor sizes that are now the norm is shortsighted at best and just plain stupid at worst. Another issue is compatibility with windows Vista. These games run just fine on Vista, but they do not auto-run from the CD, nor launch from the start menu. To get them each to play, I was forced to go into the game directory and find the actual .exe files associated with the game. This might be because I run Vista 64-bit, but that seems unlikely. I suggest just finding and downloading a NO CD hack as that *might* fix the problem, if you know what I mean.